When creating new users in your account, you will assign a unique username and password for each user. 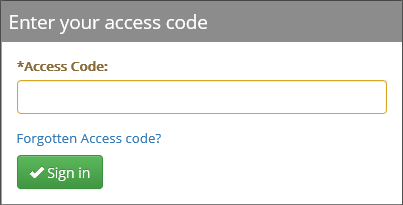 If a user has forgotten their Access Code, click the Forgotten Access code? link in the Enter your access code panel to recover the account. The account administrator can also complete the migration by editing that user and entering personal unique credentials for them. If you are unable to migrate your account for any reason, you can contact the Help Desk for assistance.